Left Foot Forward's Dominic Browne rebuts the latest Daily Mail/No2AV misreporting of electoral reform and the alternative vote referendum. Having first used a ‘vote down AV or the baby gets it’ line, then having smeared Yes to Fairer Votes funders, while refusing to reveal their own, the No2AV campaign, via the Daily Mail, is trying a new tactic: presenting untruths. The Mail reports today, under a craftily framed headline, that there are ‘fears’ a move to AV could give BNP voters “more say at the ballot box”. 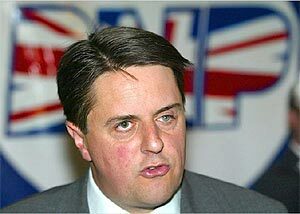 This must be why the BNP is against AV. To be fair, the Mail do report this but bury it two-thirds of the way down the piece in small paragraph sandwiched between anti-AV rhetoric. “More than 90 per cent of Labour and Conservative voters would have been unlikely to get a second vote. This is a completely false presentation of the facts. There is no truth in claim that those who vote for extremist parties get extra votes. “With AV everyone gets one vote. The difference is that with AV gives you a vote that really counts and more of a say on who your local MP is. If your first choice gets knocked out your vote is transferred to your second preference. On the issue of extremism this is particularly disingenuous. AV encourages parties to reach out to the mainstream in order to win second and third preference votes from other main parties. Why would you reach out to the supporters of a party that secured under 2% of the national vote at the last election. AV provides a clear block to so-called “Marmite” parties. “Marine Le Pen (NF) – 23%; Sarkozy (UMP) – 22%; Aubry (Socialist) – 22%. May be its time for No2AV to turn to plan D – discussing the facts of the argument? Whether the vote on the electoral system panders to the BNP or not is really of no concern, what is of concern is the vehement dislike of democracy being espoused by those who use the BNP as a crutch in this debate. I find their views absolutely reprehensible and vile, but I would not silence those who support them (ironic how those who shout nazi at the BNP at every possible occasion now try to silence a legitimate political party, whether we like them or not. That’s an entirely undemocratic stance to take. For anyone’s vote to be counted “five or six times” three conditions would have to be met. First, there would have to be sufficient candidates. Second, the voter in question would have consistently to mark transfers to the next-least-popular candidate. Third, no candidate must reach 50 per cent before five or six rounds of counting have been completed. There are no sound anti-AV arguments (or at least none that aren’t also arguments against FPTP), so the anti brigade have to keep making stuff up. See http://JnthnPhllps.blog.co.uk/2011/03/23. Lucas, you are absolutely right that no voting system should exclude a candidate or their voters because of the way the system works. However it should allow the voters to do this if the majority of them are opposed to that candidate’s views. And it is also right that a system should not allow a candidate to be elected if the majority of voters are opposed to them. FPTP fails on both these counts. The trouble is that attacking No2AV (an obviously ridiculous organisation, campaigning in a ridiculous way) on the basis that they are scaremongering and fabricating claims about AV, is a position which is completely undermined by an article which has as its central premise that FPTP is more BNP-friendly. Unfortunately, the first of the two Mail paragraphs quoted still stands. Campaigning under AV WILL encolurage attempts to gather second preferences, and in some constituencies, unpalatable, far-right, anti-immigration views (whether UKIP, BNP etc) ARE prevalent, and will have to be redistributed somewhere. Also it has to be recognised that this problem can only be exacerbated under AV: many voters currently recognise that BNP votes are wasted under FPTP, and vote elsehwere accordingly. First preference votes going to the BNP will only increase under AV. This is by no means an argument (which Sunder Katwala correctly disproves) that the BNP will be able to win enough votes to put anyone in Parliament, but the appearance of their vote-share, and correspondingly, their political salience, is likely to increase. It strikes me that the Yes campaign really is having its cake and eating it – pointing out all the manifestly ridiculous stances taken up by No2AV, and countering them with very dubious claims of their own. I myself have not yet made up my mind on AV, but will not be swayed by either side in this rather stupid, ‘you want to help the BNP’, Godwin’s Law-like debate.